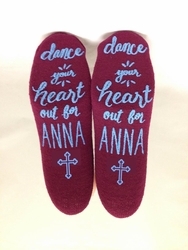 Custom Personalized Communion Grippy Sock Favors are a must have for your First Communion Party celebration! Our Personalized Sock Favors are not only fun and festive, but they are super soft and snuggly too. These Grippy Socks have a grippy tread on the bottom so when your guests wear them, there will be no slipping! Your guests will love putting these Dance Socks on during your party so they can dance the night away in comfort. Then once the party is over, your guests get to take their very on pair of Personalized Socks home to enjoy for years to come! Soft plush terrycloth will keep their toes toasty warm, and the personalized tread on the bottom of the socks will remind them of the great time they had at your First Holy Communion Celebration! 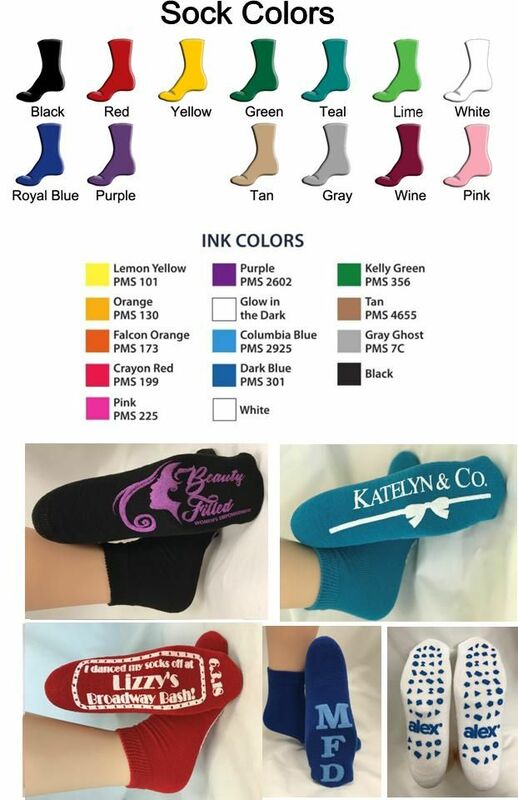 Choose your sock color and the ink color. A very cool new addition to our line of fun and functional Personalized Socks, are our Glow In The Dark Sock Favors! They can be used again and again! Glow in the dark ink is activated with indoor light or any natural light sources. After 5 minutes of light exposure, the glow in the dark ink will be activated and will last for hours! Brighter light and longer exposure time will improve the glow density and duration. The glow in the dark ink is available in “puff” white only! 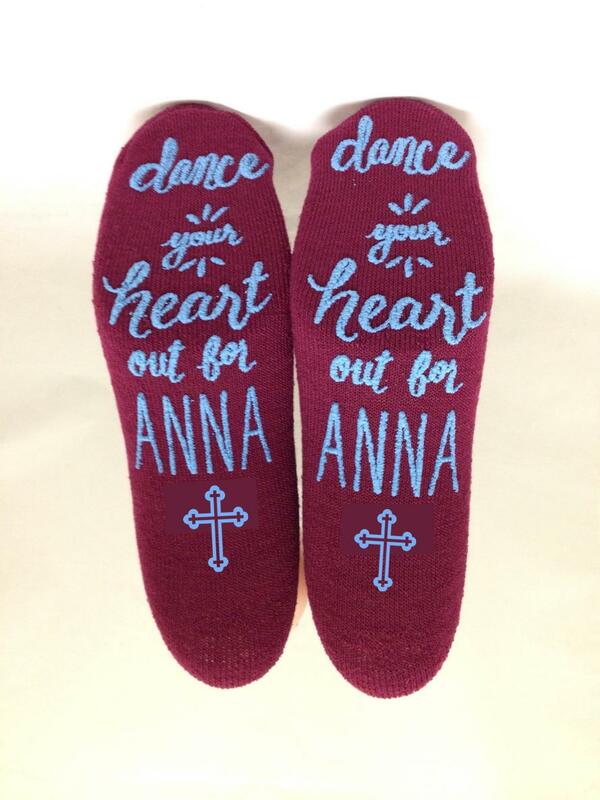 These Personalized Grippy Socks are latex free so no need to worry about allergies. They are made from 100% recycled fiber making these Sock Favors environmentally friendly and Eco-Friendly too! Our Communion Socks will fit shoe sizes 3 - 7. Perfect for the ages 8 - 10! These grippy socks are not an ankle sock. These socks are considered "half calf" (they come up near the calf) depending on your guests foot size. They may come up a bit higher for smaller feet or a bit lower on larger feet. Our Sock Favors are very affordable and WE DO NOT CHARGE A SET UP FEE!! We will even ship you a sample pair of socks FREE! Just email us, or call us, and we will be happy to send you a pair of socks so you can see just how great they are! The sample pair will not have your information on them. They are just to get an idea of the quality and look of the Grippy Socks. Please allow ample time for the sample socks to arrive and to place your order.